When I was asked whether I would be interested in reviewing a book on Court of Protection proceedings my first thought was that I was not qualified. I may have read quite a few Court of Protection judgments, and written about a number of them, but I never did any Court of Protection work when I was practising. However, when I saw that Court of Protection Made Clear has been deliberately written (in plain English) to be accessible to non-lawyers (as well as lawyers), I felt that perhaps I was perfectly qualified after all. When I received the book I was surprised by how substantial it is. For the extremely modest price I was expecting a brief introductory guide, perhaps with pointers as to where more detailed information can be found. This is not a brief introductory guide. It comprises 372 pages, with no fewer than twenty-one chapters, covering in considerable detail everything from making an application to the Court of Protection, to powers of attorney, deprivation of liberty (including a handy flowchart) and statutory wills. To top that off, there is a substantial glossary, a number of precedents and other appendices, including a table of possible applications to the Court, with basic information as to how each application is issued. The downside, I suppose, of the book being so substantial is that unless it is the reader's intention to make a detailed study of the Court of Protection with a view to becoming an expert upon the subject, then the book is not really one that invites reading from cover to cover. For anyone who is not intending to 'become an expert' that exercise may result in more confusion than insight, as it is all to easy to become overwhelmed by the sheer amount of information that the book contains. Instead, I would suggest that for most people the book is best regarded as an introduction to specific topics, and otherwise as a reference. Thus, if the reader requires information on a certain matter, they can limit themselves to reading just the chapter or chapters relevant to that matter. The detail contained by the book on each topic should be sufficient for the purposes of most readers (the authors really seem to have given a lot of consideration to what should be included), although the book does still give pointers as to where more detailed information may be found, in particular the various statutes, rules and Codes of Practice. Apart from the range of topics, one of the reasons why the book is so substantial, and one of the reasons why I say that the information it contains should be sufficient for the purposes of most readers, is that it covers both the theory and the practice. Thus, for example, you will not just find the legal background to making an application to the Court, but also details of the procedure involved (right up to, and even beyond, the hearing, including such details as how to address the judge) and practical help upon the completion of the myriad forms that are or may be required. As I said, if you do want more information, then the book contains pointers to where it may be found. The help, though, does not stop there. The book is accompanied by a website, courtofprotectionhub.uk, which includes links to that other information, relevant forms and commentaries on recent cases. I am not aware of any other book like this, and thus if you have an interest in the work of the Court of Protection, whether as a practitioner (even if you are already one of those 'experts'), someone who works with vulnerable people, or simply as a family member of someone involved in Court of Protection proceedings, then I would say that Court of Protection Made Clear is an essential purchase. The amount of information it contains, all presented in a clear, jargon-free manner, and all at a price that anyone should be able to afford, will surely help you demystify the arcane world of the Court of Protection. Certainly, I now feel I have a greater knowledge and understanding of the subject (even if my brain has only retained a fraction of the book's contents), along with a very useful first point of reference. 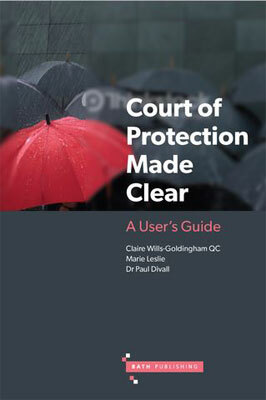 Court of Protection Made Clear can be purchased from Bath Publishing, here. It is available in print or digital format or, for an additional £10, both.